On Christmas Day 1885, Bishop Redwood blessed St Joseph’s Church. When it was burnt down three years later, Suzanne set off on a collecting tour of NZ, returning in 1893 with £1000 – enough to build a new church and convent. In 1892 Archbishop Redwood appointed Suzanne as Mother Superior of the newly established Daughters of Our Lady of Compassion. During her tour, Suzanne had become acutely aware of the challenges faced by poor and unmarried mothers and their babies. She took 74 babies and children into their care but Hiruharama was too isolated from medical services. So Suzanne set her sights on Wellington, arriving unannounced in the city in 1899 with two Sisters. 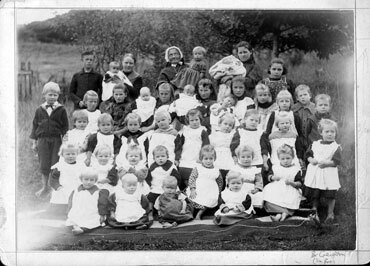 Suzanne Aubert with children at Jerusalem in 1898.